Pewterspear Green, Warrington, Cheshire Commissioned by Commission for New Towns, through Chris Blandford Associates Landscape Architects, Chester. The Roman theme was drawn from the knowledge that the course of a former Roman road crosses the site. 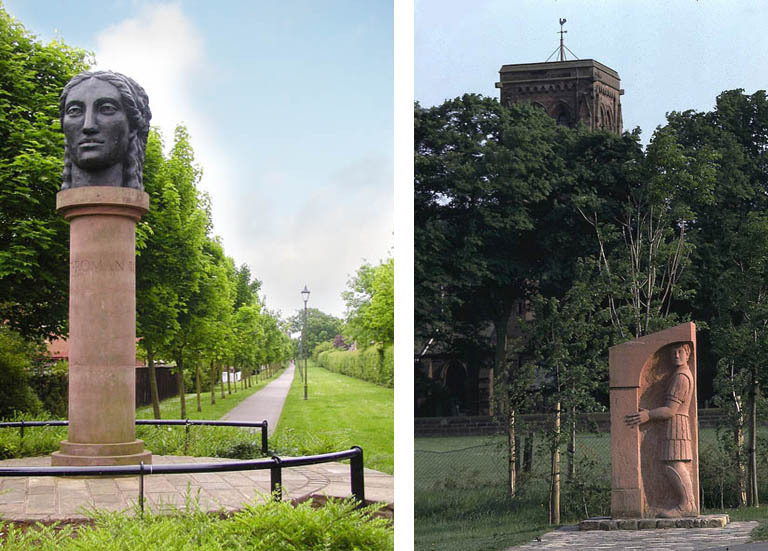 A 2.5m high, turned red sandstone column, 600mm diameter, supporting 1.3m high cast bronze double faced Janus head. Diane created a female/male version which was cast at Castle Fine Arts Foundry, Oswestry. Sandstone column supplied and manufactured by J Oldham & Co Ltd. Philip carved the lettering on the column. The Centurion and Legionary were commissioned four years earlier than Janus. Made from 2m high sandstone blocks carved by Philip, with some assistance from David Lewis and Diane.